Before she became a teacher, Emily Hammond was always inspired by the educators who made her feel like she mattered. 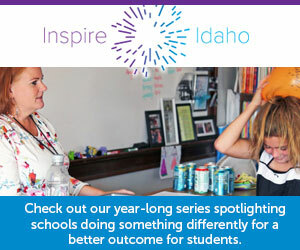 In honor of Teacher Appreciation Week, Idaho Education News caught up with Hammond, who teaches fifth grade at Boise’s Longfellow Elementary, to discuss teachers who inspire her, why she got into the profession and what she hopes to accomplish in her career. Given her profession, it’s not surprising that Hammond can still name every one of her teachers and share a poignant moment she experienced with them growing up in Oregon and Washington. But a few stand out. Mr. Nelson, from sixth grade, read all of C.S. Lewis’ “The Chronicles of Narnia” to Hammond and the rest of the class. Then there was Mrs. Orr, a junior high art teacher who connected with Hammond during a time when her family moved around frequently and Hammond struggled to fit in with the in crowd. “She took the time to really connect with me and talk to me – not just teach me about art,” Hammond said. Two simple acts of kindness stand out all these years later. First, Orr invited Hammond to share lunch with her. Later, Orr gave Hammond an elegant clay bear that she made. “I think of her because of the connection she made with me, more than anything else,” Hammond said. Originally, Hammond considered making a career in business or international relations. But she changed her mind at the University of Idaho when she met preschool teacher Pat Bennett during a work study program. The experience inspired Hammond to change her major to elementary education and put herself on a path to teach children. Hammond has worked as an English teacher, reading specialist and elementary teacher since 1999. What keeps her going – and what gets her up in the morning – is the chance to connect with her students in the way that Mr. Nelson and Mrs. Orr did for her. Sometimes, she’s surprised with unexpected reunions with students – like a trip to the fair last summer when a former student tracked her down to share her progress in life and thank Hammond for being such a role model. Is there a special teacher who inspires you who Ed News should consider highlighting in a future article? Let us know who that teacher is and where he or she teaches in the comments below.